Two significant federal grants are coming to Western New York to strengthen a local food network and foster more healthy eating by Erie County's older citizens. Leaders including Rep. Brian Higgins (D-Buffalo), New York State Assemblymember Sean Ryan (D-Buffalo), Erie County Executive Mark Poloncarz and Buffalo Common Councilmember David Rivera gathered inside the West Side Bazaar Wednesday, which hosts small business startups and incubators and food vendors offering a variety of international cuisines. The facility has served as a host for many recent immigrants to get businesses started in Buffalo. The Bazaar's operator, the Westminster Economic Development Initiative (WEDI), is one of the two recipients of hundreds of thousands of federal dollars. Ben Bissell, executive director of the Westminster Economic Development Initiative, speaks during a news conference announcing a pair of federal grants, one of which his organization is receiving. WEDI will receive $375,000 from a competitive grant program administered by the U.S. Department of Agriculture. The money will help them expand food-related services, including sustainable services and cooking classes within the Bazaar, and the formation of new relationships with local farmers to further secure a local food network. "We're really excited to be now moving more fully into our food system role and to be working on all the different ways that we can help bring nutrition and culturally relevant food to all of the neighbors and friends who come to the West Side Bazaar every day," said Bryana DiFonzo, WEDI's Community Development Director. The West Side Bazaar, which currently hosts nine retailers and nine restaurants inside its home on Grant Street near West Ferry, is also looking to expand. Ben Bissell, executive director of WEDI, said the organization has not yet identified a new space but hopes to have a plan by the end of the year. 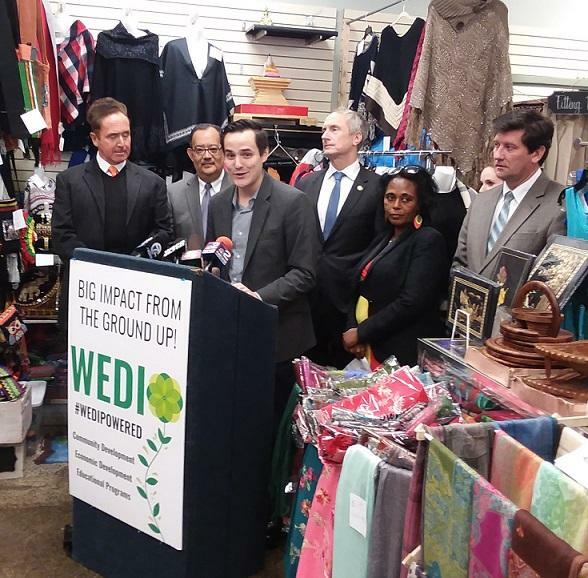 He also stated that WEDI is committed to keeping the Bazaar somewhere on the West Side. Meanwhile, Erie County's Senior Services Department is receiving $500,000 over the next two years to expand its senior dining program. The money will, according to county officials, allow eligible senior citizens to dine out at participating establishments with whomever they choose, choosing from a menu of pre-fixed meal options made to order. "Usually in congregate senior care there will be a set menu that's served all across the county. This is a little different," said Poloncarz. "Our Senior Services Department is working with the restaurateurs to determine appropriate food for the program that's to be served that day. Eateries in Buffalo, Hamburg and Springville are joining an already expanding list of options, according to county officials. 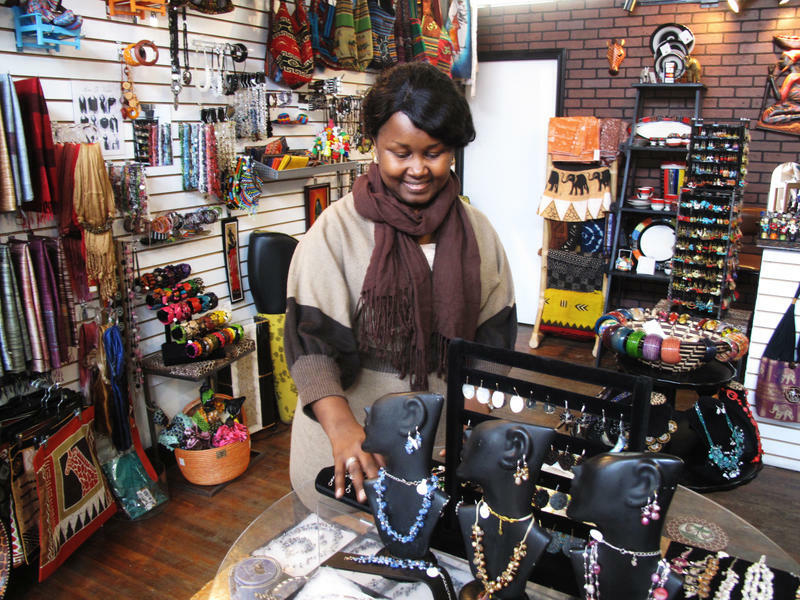 The organization that oversees a boutique and business incubator for immigrants and refugees has been nominated by the City of Buffalo for a cash grant that could help bring a desired expansion closer to reality. If you want to see how refugees are changing Buffalo, N.Y., the West Side Bazaar is a good place to start. It's an incubator for immigrant-owned businesses. And it's the only place in town where you can eat Ethiopian sponge bread, Burmese noodles and Peruvian chicken at the same table. It's also a market with clothing and gifts. "We are like family here — families from different countries," says Nadeen Yousef, who moved to Buffalo from Iraq last year. Yousef now has a booth at the bazaar, where she sells handmade macrame wall hangings and art.